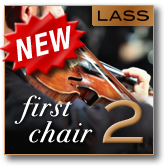 We are proud to announce LASS First Chair 2 (LASS FC 2), one of the 2 reduced sound sets of LASS Full 2‘s library. LASS FC 2 features solo instruments performed by the section leaders. Rather than sounding like “guest soloists,” these instruments sound like the first chair players they actually are, blending perfectly with the sections they came from. While LASS FC 2 does not include LASS Full 2′s ARC (Audiobro Remote Control), all of LASS FC 2′s patches are the same as LASS Full’s “First Chair” patches… with the exception of not including LASS Full’s Stage and Color features. However, we did add a taste of our new Color technology to LASS FC 2. There is a new “Color” button that lets you use our Bat Man Color profile. Pre-programmed Multis are included so you can simply load them up and play!! LASS FC 2 is a great way to be introduced to the LA Scoring Strings concept and there is a dollar-for-dollar upgrade path (based on the current sale price of the product) to the full version of LA Scoring Strings (see store for more details). New exclusive reverb Impulse Responses. We’ve included a single Color Profile (Bat Man) from LASS Full 2 that you can enjoy. Pre-built Multis are already set up for you. Micro Tuning and real-time performance of tuning. A CC Attenuation knob that allows on to ride CC attenuation in real-time or after-the-fact for added dynamic control. A new User Interface that is easier to read and more pleasurable to look at. New Master Patches that consolidated articulation options that would have previously been on multiple patches. Stage and Color – At the heart of Stage & Color is a collection of exclusive orchestral sound profiles (colors) inspired by famous movie scores and recordings. Now, at the push of a button, LASS can adopt the tonal characteristics of some of the most coveted scores and recordings. A new ARC (Audiobro Remote Control) master script that will allow for dramatically easier control of all sections and divisis from a single window. Reverb and width controls of multiple patches from within the ARC. ART programming of multiple patches from within the ARC. CC Table control of multiple patches from within the ARC. Auto Arranger control of multiple patches from within the ARC. A new Key Switching approach of multiple patches from within the ARC. A drastically reduced footprint of only about 18Gb due to the inclusion of NI’s NCW (loss-less compression audio file format) files. We include the 24 bit files since it will be about 30% less taxing on your hard drive than a 24 .wav file. We noticed no measurable CPU hit using the NCW files… and we did a lot of testing. The main difference between LASS FC 2 and the full version is that LASS FC 2 does not contain the Divisi Sections or the Full mix patches or the ARC (Audiobro Remote Control — a LASS Full 2.0 feature only). 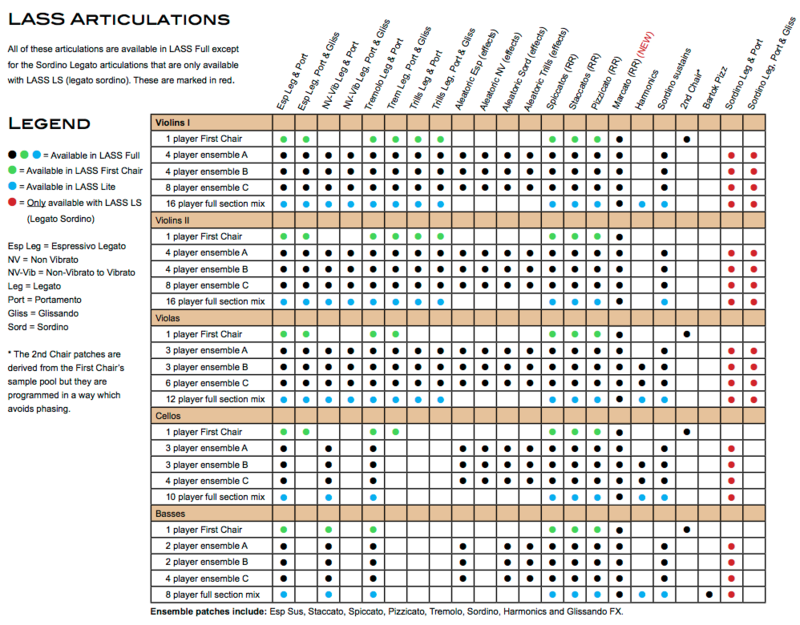 The chart below shows what patches and articulations come with LASS FC 2. All the “blue” patches come with LASS Lite 2 (the “green” are for LASS FC 2 and everything else is included in the full version of LASS). 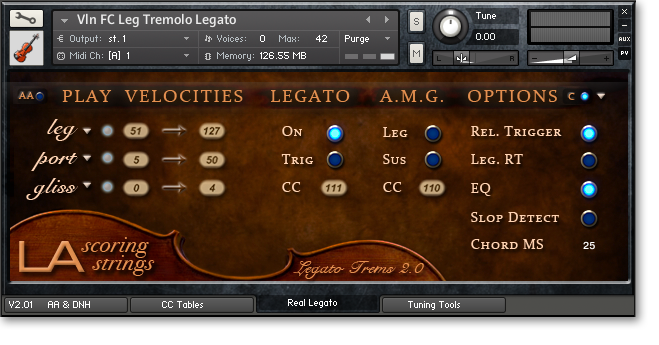 LASS FC 2 is a Kontakt based sample library and runs on Kontakt 5.02 or Kontakt Player 5.02. Kontakt Player 5 is available as a free download from Native Instruments’ website. What’s the difference between LASS FC 2 and LASS Full 2? While LASS FC 2 offers you first chair (solo) patches, it does not contain the divisi ensemble patches or the “Full Mix” patches. Nor does it include the ARC (Audiobro Remote Control) which is a LASS Full 2.0 feature only. However, the patches included in LASS Lite work exactly the same way as the same patches in the full version of LASS (minus the ARC and the Marcato patches)… there is no difference in the patch functionality. You still get the great ART script and Auto Arranger script and every other script that comes with the full version of LASS… just not the divisi or first chair patches or the Stage & Color feature. LASS FC 2 is a downloadable library and uses the new Native Instruments NCW loss-less compression in 16 bit format to save you hard disk space and also reduce your download times. Requires Kontakt Player 5.02 or later. Click here to download the latest FREE version.